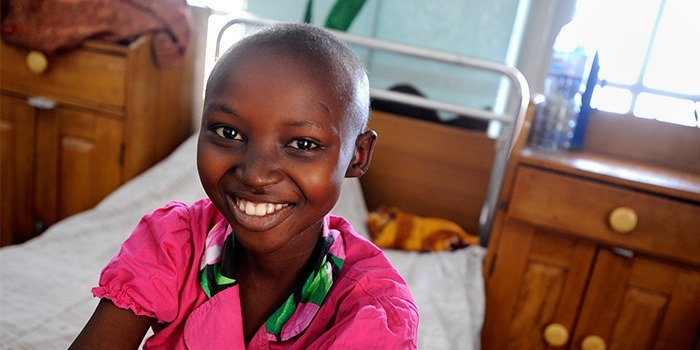 Grace Mbabazi, 12-years-old, undergoing treatment for Burkitt lymphoma, at Uganda Cancer Institute. Photo by Jacqueline Koch for Fred Hutch. Every year cancer is responsible for one in every six deaths worldwide. In fact, cancer is the cause of more deaths globally than AIDS, tuberculosis and malaria combined. According to global estimates from the International Agency for Research on Cancer, (IARC) there were 18.1 million new cancer cases, and 9.6 million cancer deaths in 2018. Population growth and aging are largely responsible for the global cancer burden, but lifestyle choices such as smoking and unhealthy eating habits also contribute to growing numbers. By 2040 IARC estimates there will be 27.5 million new cancer cases, and 16.3 million cancer deaths. This growing cancer burden has a negative impact on the global economy. According to the American Cancer Society, the global cost of cancer is hundreds of billions of dollars a year. The exact cost can be difficult to estimate because they include direct costs (treatment, care and rehabilitation), indirect costs (missed work days and premature deaths) and hidden costs (health insurance premiums, and non-medical expenses such as transportation, child and elder care, assistance with housework, and more). Another reason it is hard to estimate the full economic impact of cancer is because of vast inequalities globally in access to cancer prevention and treatment services. According to the World Health Organization, 30 to 50 percent of cancers worldwide could be prevented. However, addressing the growing cancer burden in low- and middle-income countries (LMICs) is challenging. A growing cancer burden in LMICs is compounded by the inaccessibility of information about prevention, early detection services and treatment. Additionally, when a country has inadequate medical and public health infrastructure, many cancers are diagnosed at later stages, leading to more cancer deaths. For example, the survival rate of breast cancer in the United States and Australia was 90 percent between 2010-2014, while in Malaysia during that same time period the survival rate was 64 percent. In sub-Saharan Africa, breast cancer is one of the three most common cancers, and the second-leading cause of cancer deaths in women (after cervical cancer). Read Global Washington’s interview with Dr. Tom Uldrick, Deputy Head of Global Oncology at Fred Hutchinson Cancer Research Center. People in LMICs are also three times more likely to get an infection-related cancer such as stomach, liver and cervical cancers. PATH, a global health nonprofit, is working toward the global elimination of cervical cancer through its Cervical Cancer Prevention Program. The program increases access to screening and pre-cancer treatment through innovative low-cost diagnostics such as DNA tests for human papillomavirus (HPV), combined with scaling up access to HPV vaccines and the introduction of low-cost ablative therapy. Access to cancer prevention and treatment is challenging when only one or two hospitals within a country offer cancer health services. This requires expensive travel for patients, and long stays away from home to receive care. In order to address this issue, the American Cancer Society has partnered with Kenyatta National Hospital in Kenya to build a 62-bed Hope Hostel, breaking ground this year, where patients can stay while receiving treatment in Nairobi. Providing continued cancer care, ensuring a reliable drug and diagnostic supply chain, and access to affordable cancer medications are also challenges in LMICs. In 2017 The Max Foundation developed a patient-centered model for delivering cancer treatment, a program called Max Access Solutions. This program works directly with doctors and patients to combine wrap-around support with a real-time tracking tool to monitor patient medications, donated cancer medication, and supply chain logistics to help patients get what they need to fight cancer. Read Global Washington’s interview with Pat Garcia-Gonzalez, co-founder and CEO of The Max Foundation. In order to help LMICs obtain expensive cancer medications the American Cancer Society, Clinton Health Access Initiative, Pfizer and Cipla announced a plan in 2017 to expand access to 16 essential cancer treatment medications in six sub-Saharan African countries. The market access agreements provide these African governments with increased savings and the availability of quality treatment options. Read Global Washington’s interview with Ambassador Sally Cowal, SVP Global Health, American Cancer Society. Cancer prevention and treatment also requires trained healthcare workers. The American Cancer Society has a number of training initiatives to help LMICs build capacity to address the growing cancer burden. For example, ChemoSafe is a program to train healthcare professionals in the safe handling and administration of chemotherapy in sub-Saharan Africa. Additionally, the American Cancer Society is working with the African Cancer Coalition, and other partners, to develop standard cancer treatment guidelines. In 2016, the American Cancer Society also launched the SOURCE (Strengthening Organizations for a United Response to the Cancer Epidemic) Program in Kenya and Uganda in order to provide competency-based training and technical assistance to local cancer NGOs. Challenges of access, training and affordability continue to make cancer prevention and treatment in LMICs complex. While a number of organizations, including Global Washington members, are working hard to address these challenges, without scaling up these programs and services the global cancer burden will continue to grow. As the world comes together on February 4, 2019 for World Cancer Day we are being challenged as individuals and communities to ask ourselves: 1. Who are we? and 2. What are we going to do about the global cancer burden? This year the global community should celebrate its successes, but also acknowledge that more needs to be done by everyone to create a future without cancer.